of a pentatonic (five-note) scale. Newquist Metalsmithing and its collaborative offshoot, The Harmonic Forge, are a new and unique addition to Brattleboro, bringing together the talents of two recent arrivals to the area -- Erik Newquist, metalsmith, from Washington State, and Garry Jones, musician, from Queensland, Australia. 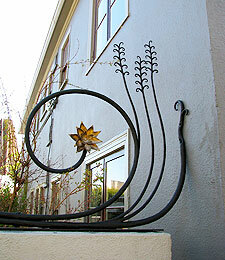 Erik began his metalworking career at the age of 16 by making knives out of files and hacksaw blades in his backyard. He apprenticed with master blacksmith Paul Thorne of Annacortes, Washington, and then set up shop in his parents' woodshed with a smoky coal forge, a tiny anvil, and barely enough room to stand upright. Eventually, his father allowed him to move the shop into the carport, and from there it expanded into the garage. Luckily for his parents, Erik moved out before he could take over the rest of the house. After four years of running a successful business making custom, hand-forged sculptural artwork in California, in 2009 Erik followed his wife, Radha Newsom, to Brattleboro, so she could attend the New England Center for Circus Arts. The couple fell in love with Vermont and decided to remain. Erik's workshop is an inventor's laboratory, blacksmith, and fabrication and repair shop. On any given day, Erik could be creating a one-of-a-kind hand-forged gate, a chandelier, a human-sized birdcage, a spiral staircase, or circus aerial apparatus. Or he could be out on a farm repairing a tractor bucket or on a logging site repairing a truck bed. His clients include galleries and architectural firms, farmers and loggers, circus and theater performers. Asked why he loves blacksmithing and welding, Erik replies, "I like making things, and there is a satisfaction that comes with completing a project with high-quality craftsmanship. I like understanding how things work. And I like hammering on really hot metal and shaping it any which way." Like Erik, Garry Jones followed his wife, Kate Hennessy, a native Vermonter, to settle in the Brattleboro area in 2009. He has been designing and building interactive musical sculptures and instruments since 1994. His work is featured in public parks and gardens, museums, schools, therapy institutions, disability resource centers, and private residences in the United States, Ireland, and Australia. He is also a professional musician and composer who performs internationally. 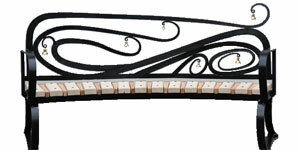 As a musician he brings his musical ear to the installations, ensuring that they are precisely tuned and easy to play. As a designer he brings an aesthetic sense that broadens not only the arena of traditional metalsmithing but also of public installations, whether practical, such as park benches or recycling bins, or artistic, such as water and stone sculptures. Garry not only is dedicated to expanding our notions of what a musical instrument can be, he also believes in bringing music to people who neither have access to playing it nor are encouraged to play. "As a society," he says, "we are led to believe that only specialists, those with talent, can play music. Everyone can play music. We all have it in us. I want to help make music accessible to those who never had a chance to explore it. For example, I design instruments that someone in a wheelchair can perform on, and I might tune the instruments in a pentatonic (five-note) scale. In this way, you can never play a wrong note. And with the installations in public spaces, such as the musical park bench, the instrument costs nothing for the performer. 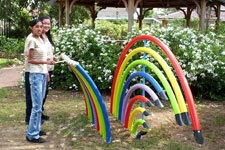 You may not be able to take it home with you, but it is free, and it encourages people to play together." played with a "beater" or mallet. 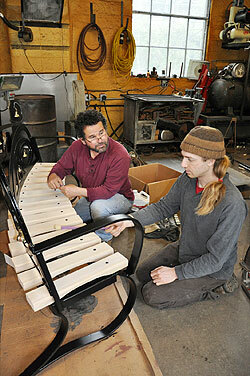 Erik met Garry over a musical trashcan and shortly thereafter, a hand-forged musical bench was born. Their first collaborative piece, "Steel, Wood, Melody," combines metal-working art with musical sculpturing in a work of whimsical beauty that is both a serious musical instrument and a functional garden bench seat. "Comfortably melodic," Garry adds. Currently, Erik and Garry are working on a variation of the musical park bench that will not require beaters, allowing them to be placed in public spaces such as parks, gardens, and streets. Also on the drawing board are a number of designs that create music from natural energy sources: wind, water, sun, rain, snow, gravity, and convection. "We want to use those natural forces that constantly shape and influence our lives as a source of music that invites people to interact playfully and creatively with those forces and with each other," Garry explains. "This has the potential to affect the way we see those natural elements. It can bring us into a more intimate relationship with our surroundings and a deeper understanding of how these natural forces work and influence us." 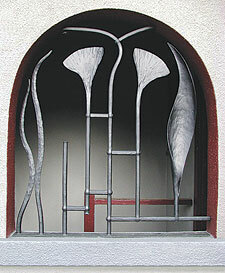 At their Open Studio on Gallery Walk, Newquist will be demonstrating blacksmithing techniques at 6:00 and 7:00 p.m., and will have his hand-forged artwork and functional pieces on display. Jones will display handmade musical instruments, including marimbas and other odd contraptions on which everyone, adult or child, is encouraged to play. On sale will be his CD of original work composed on some of his instruments (including using an extinct volcano as a percussion instrument). Also on display will be their latest collaboration. Joy Carder's "Joybots" are a very likeable bunch, indeed! They are joined by a third area artist, Joy Carder, whose work, also forged in the workshop, takes found objects -- farm implements, metal tools and recycled metals -- and transforms them into whimsical robot figures called "Joybots." The Harmonic Forge and Newquist Metalsmithing are at 28 Williams Street, Brattleboro, adjacent to the Whetstone Studio for the Arts. Shop hours are 9:00 to 5:30, and from 5:30 to 8:30 on Gallery Walk. Telephone: (802) 451-8781.